Pixologic specializes in 3D sculpting software, such as the free and easy-to-use Sculptris. ZBrush is best thought of as Sculptris's advanced cousin, as it's also focused on sculpting 3D figures, but at an exponentially greater level of control. 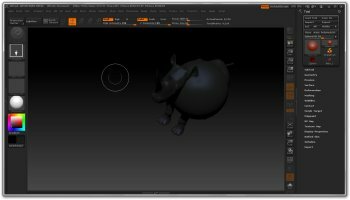 There are a ton of recommendations on ZBrush's website from 3D animators from films such as Chronicles of Narnia: The Voyage of the Dawn Treader, and that's because professional tool ZBrush ($700, 30-day free trial) is very intuitive to use. Modifying existing templates in Zbrush is a breeze. And that's what ZBrush is useful for: designing individual characters in 3D as if you were modeling them out of clay, and also designing environments. The nice thing is, if you want that simplicity that sister product Sculptris provides, it's easy to go back and forth between the apps using the Preferences -&gt; GoZ menu. Files created in ZBrush can also export into many other popular 3D graphics applications such as 3D Studio Max. Note: The trial of ZBrush is full-featured for 30 days of actual running time, and you have 45 days to use it. However, when you close and re-open the trial, you'll have to activate it on the website with your registered username again, so you're better off leaving it open. The full version is $700.